How is everyone doing on this beautiful friday? I don't know about you but there's something magical about fridays. We had a national holiday on last wednesday and that somehow messes my week up. But here we are at the start of the weekend. I hope you have something fun planned or maybe just a nice and quiet one. I'll take the second option. I love me some nice and quiet. It makes for the best me time moments. As you probably noticed it's been a while since I was on here. I was busy with the shop and it was a lot of fun but also a lot of work without really being profitable. And I am just not feeling it anymore. It took my love and passion for the arts and crafts to a level I don't want it to go. Made it feel like work. That in turn killed my inspiration to design and create. I decided to go back to the basics and that for me means back to mixed media art and just having fun with my planner. If/When I design something I'll be sure to share it here and in the FB group. If you're not a member yet you should really join and check out all the freebies. I am most active on IG and FB so let's be friends there. Just scan my IG nametag to follow me. If you want to join the FB group you can follow the link under the MDF Group tab 👆 Hope to see you there! Happy almost weekend. Depending on your timezone it might already be friday. It's Letter Size and I made it a png. So if you print it on normal white paper it's just as you see it here on the pic. BUT... print it on vellum or acetate and magic! Try it and tag me in your pics. I love to see what you do with it! I think i'll make a dashboard or an insert cover. Or maybe both. I don't know yet. Keep an eye on my IG for the result. Another something I'm working on. I am going to cut these out and play with them. The bows will be turned into paper clips and the cup will be laminated so it lasts longer. Plus with it being laminated I can put my sticky notes to the back of it. Pics will be coming to my IG. I'm off to play. Byeeee. Happy Friyay! Finally the weekend is here. I don't know about you but I'm very happy it's the weekend. How have you been? How was your week? Crazy busy like mine or nice and easy like I wish mine was ;) ? Let's just say I'm keeping myself very busy. Recently I decided to switch up everything (again) and go back to Blogger. Said goodbye to Wordpress and it's crazy and let's not forget it's expensive stuff. I thought to myself why pay all this money for hosting a website that still needs Etsy to sell my products?? Isn't that insane? Sooo guess what. I reopened the Etsy shop. Updated my Blogger blog and thought that's it. So instead of sitting at my desk designing cool stuff for you guys I was back at thinking about how to do this. I don't want to have my and your costs going up so I went searching for a way to have a shop (without Etsy) and keep my free blog. My search was successful. I found a way to integrate a shop right here. It's a bit different then you're used to with Etsy but it works and it's a simple fix really. I'm so freakin happy! I do have to admit that this system of mine gives me a lot more work to put everything properly up and running but I love that it gives me the opportunity to put up a bunch of products without all those ridiculous fees. 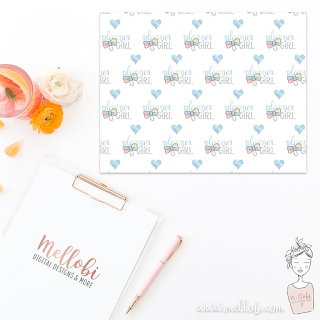 To celebrate I designed a special freebie for the members of Mellobi Designs. I am getting rid of the Resource Library and saying goodbye to the newsletters all together. It's just too much of a hassle. Instead I am moving all this good stuff over to my Facebook Group. 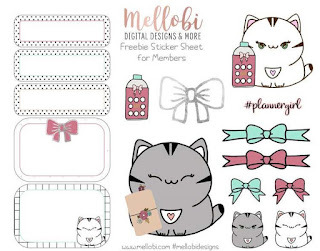 So there's a final newsletter going out today with these updates and then I hope to see you all in the Mellobi Designs' Friends Group on Facebook. Here's a peek at the special freebie waiting for you in the group.